Ajay Sharma was working as a teacher on Government Inter College, Phalawada. In 2004, he suffered a brain haemorrhage and was in coma for 15 days. After recovering from his illness, he felt he had been given a new lease of life and decided to lead this second life dedicating himself selflessly to society. He was shocked at a story in the newspaper about an HIV positive orphan boy whose relatives killed him, packed his body in a suitcase and abandoned it on a train. This was when he met a 2-year-old HIV-positive boy Akhil. Akhil was malnourished, anaemic and was shunned by his family. Ajay could not walk away. He took Akhil in, and cared for him, just like he would for his own two children. 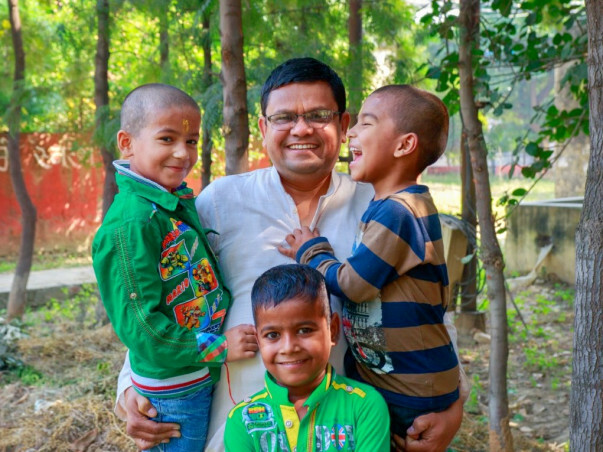 Ajay resigned from his job, and with the moral and financial support of his wife, Babita, started the Satyakam Sewa Ashram in Meerut, Uttar Pradesh. “Innocent children with HIV are most vulnerable, because no one wants them. They are written off even before they can get a good start. I felt that maybe I got my second chance to help Akhil. 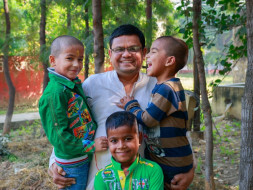 In time, more children like him joined our family,” Ajay explains. And a family is what the children are to him. All the children at the house refer to Ajay as “Pitaji”. The children themselves, are not aware of being infected. Only the older ones even know what HIV is. 13 out of 14 children were infected at birth. One child contracted it when he was sexually abused as a child. But he doesn't remember much about it. He dreams of being a policeman and catching bad guys. Like all the other children, he has found peace and happiness in his new home. Ajay makes sure that these children get the best shot at a good life. This means staying positive and living a healthy life. The children wake up early in the morning to do yoga. They eat a nutritious meal on time and sleep early. They can also never miss a dose of the medicines they need to take to stave off illness. Ajay endured fear and discrimination from his neighbours, schools and society who were worried, the 'infection' would spread. Patiently, he and his wife showed them by example. The local doctors who come here laud Ajay and Babita's work for the awareness about HIV that Satyakam creates. Providing this good a life for his children is expensive and the medicines alone cost up to Rs 4,000 per month for each child. Unlike other parents, Ajay cannot promise the children an easy life. He is prepared to see these children, who mean so much to him, succumb to bad health. But he leaves no stone unturned in taking care of them. This means, giving them the best medicines and healthcare. “There are nights when I am so worried about their health and the future, that I can't sleep. I feel choked by sadness and fear. But I think of God, remind myself to be strong and focus on what needs to be done,” Ajay says. 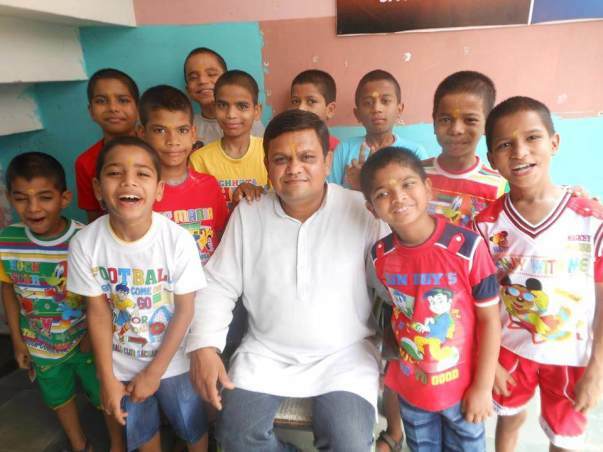 Ajay seeks your support to ensure the quality of services being given to the 14 kids is not compromised. 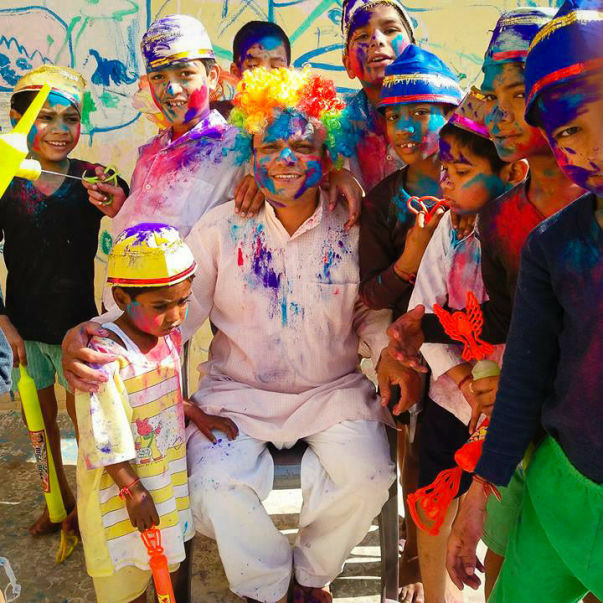 Support Satyakam and help abandoned, HIV-infected children have the opportunity to live normal lives. Your support will show this man that he is not alone in making the world a better place. The Satyakam family joins hands in thanking you for the generosity of spirit you have shown to our campaign. Our hearts beat as one for the destitute children who seek support and love. The world has become fast paced and self-centred and to find the large-heartedness of so many selfless donors is no mean feat. The human chain of sympathy and empathy has given new life to the beneficiaries of this largesse. Hope makes the world go round. 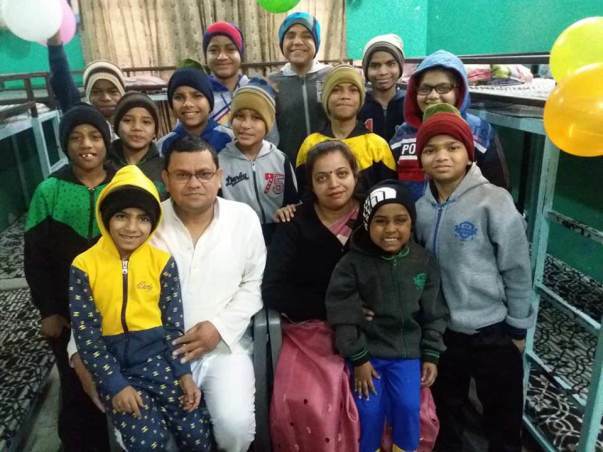 Your donations are used to pay for the food, medical and education needs of these homeless children who have found shelter in the Ashram at Meerut. The society looks past these abandoned children but you, our patrons have opened your hearts and pockets to help spread the word and keep the flame of hope burning strongly. These HIV+ children find succour and relief when nourished with affection and care that they have never found outside the walls of the Foundation. You have donated your hard earned money and now we urge you to spend some of your invaluable time with these children. Your company and affection will help them revive lost aspirations and show them new dreams. The happy mind makes the body strong. Your contribution will be encouragement for these little buds of humanity to blossom. The generous hand that you reach out with becomes the cornerstone of our efforts to rehabilitate these helpless souls who ask for little and hope for even lesser. The gratitude and belief that the children carry is the ray of sunshine in their otherwise bleak lives. Satyakam thanks you on their behalf for nurturing lost lives and bringing them into the whirlwind of normalcy. We hope to see you as a benefactor and well-wisher till the last child has been helped on their way to health and freedom. Hi all donors and supporters! We are grateful for all help we've received so far with our campaign. The kids are ensured with all necessary services at the care home on readily note, with no tension of "short funds" so far. We invite everyone to our care home at Meerut. We are immensely thankful to all of you for the constant love and support! The funds are majorly being utilized for the medical expenses of the kids. Kids undergo regular checkups and two of our kids are under 3rd line treatment and hence require further treatment. Also there are other expenses of education and food. Please share the campaign. Will keep you posted.